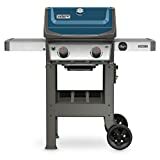 Char-Griller 3001 Grillin is blessed with 12,000 BTU Side Burner and construction is solid and strong also featured with Porcelain coated cast-iron grill grates(currently best in industry) the cooking area is 630 Sq. 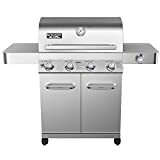 trust me it is sufficient for perfect grill day and the handle is provided with wooden hoods that keeps them cool so no issue of safety also the Char-Griller 3001 Grillin is attached with electronic ignition that is also very essential now days, side self makes it so comfortable convenient prep workspace. The Side burner is like extra space for extra food! you can fry anything or make sauces,fry bacon while preparing the steaks on the grill,trust me it is very much helpful and worth it,also the bottom part is attached to two small wheels which can be easily make your grill move without extra efforts and two gripe legs make it stable while grilling! 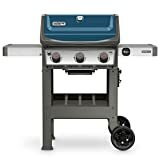 This is truly best gas grills under $200 I have a large Member’s Mark grill, which does a great job, but not as good as this one. As for the pricing aspect, there are many grills with more burners, fancy cabinets etc. available in the market but I will certainly not waste any money on them. If you visit your local store, and try to make a comparison between this model and others available at this range, and try to lift the floor models, you will understand the difference in the quality of the two products and will understand, which the superior one, between the two is. 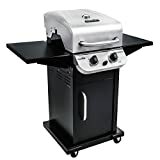 All the reviews that I have seen indicate having a cover for this grill, but I have a patio where I keep it when I am not using it. 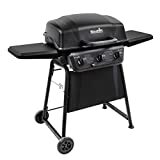 It is my honest proposition for you to read the reviews for this grill and buy it, if you need one, as this is the Best Buy and surely, a Great Product at this price range. The packaging of this product is very functional and handy, and it is very easy to unpack and reassemble the entire grill. It becomes a bit difficult at times while assembling due to the instructions and it took me hours. It would be a lot easy if two persons take up the initiative of assembly. The instructions were little confusing, and may not be the best. We did a 2-hour curing process with the help of peanut oil. The manual did instruct to keep the grill closed and keep the temperature as low as 250 degrees. Nevertheless, I had to keep the lid open with an old pot in order to keep the grill at that low a temperature. (I surely feel that the factor, which influenced this, was the Florida Summers.) Cooking on Char-Griller 3001 Grillin makes me feel as great as this grill is evenly heated with well-shielded burners and they are nice and deep. I have cooked Burgers, Portobello Caps and Shish Kebabs, all on low-temperature setting. All this time, I have closed the lids and walked away, but my food has not burnt. In the cheaper grills, while you are using low temperature and keep the lids closed for too long, the food is meant to be burnt. However, this grill lets you slow-cook the food, and everything comes out exquisite. The grate-handle allow you to pull out the grates easily. Cleaning the graters are easy and one can use soap, water and a dish scrubbing brush. I had to use the same after making cheeseburgers but not after the shish kebabs. The side trays get very hot but it can again be due to Summers of Florida. They apparently absorb a lot of heat from the grill due to its proximity. Last but not the least the grill is very wide. So, make sure you have a door space to accommodate if you are assembling it indoors. Overall, it is a GREAT Grill to cook on, and a lot of food can be cooked on it. Over time, I have owned and dumped many grills but this one surely feels different. I hate to spend a lot of money on outdoor grills, as their shelf life is not more than three years as they rust into useless mess and I have to drag it down three flights of stairs before throwing them out. It took a little longer than the other grills while assembling, but all I required was a lot of time and my old Philips screwdriver and I was done with the work in hand. I have used it many times, and I can finally comment that it is a well-built, good grilling machinery. I made a Tri-Tip steak for the first time, and it was very delicious. It was crusty on the outside and juicy medium rare on the inside. It took me some time to figure out the burner settings and I started at 450 degrees and then, brought it down to 275 but the meat was perfect. I have repaired many grills over a span of time, but I feel repairing this will be very easy. The website provides all the parts, which are required to be replaced. It is a great bargain at $200.